A special BBC award has been presented to the family of Doctor John Hinds, the Northern Ireland motorcycling medic killed at a race near Dublin in July. County Armagh native Hinds was known as one of the 'flying doctors' who provided medical cover at motorcycling events throughout Ireland. 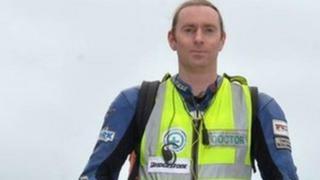 Dr Hinds, 35, died after being in an accident at the Skerries 100 meeting.